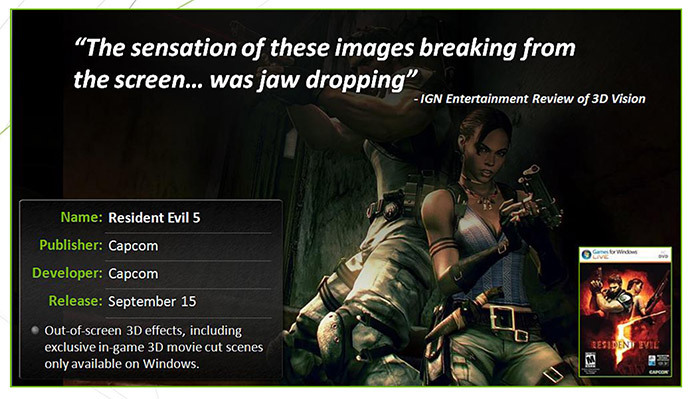 Now what is especially interesting about the PC version of RE5 is that with it you will be the first to experience stereoscopic 3D out of screen effects as your living room is transformed into the world of Kijuju (as Nvidia and Capcom state). Infected Majini coming at you from every angle, dust flying in and out of screen and the scariest bosses to date are taken up a notch. 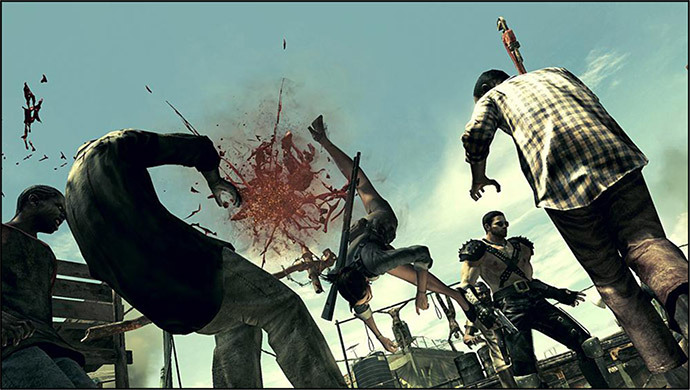 Resident Evil 5 PC is a whole new level of fear you’ll never forget if you play the game with 3D Vision equipped system, bringing it to the maximum possible realism level. Up until this point, games have taken advantage of “Depth of Field” effects that make the game appear as though the player is looking through a window into the game world. But the holy grail of 3D is “Out-of-Screen” effects (although a bit more tiring for the eyes and the brain), and Resident Evil 5 is among the first games to exploit out-of-screen effects, making thrown objects and zombie blood appear as if they are literally popping out of the screen (note that it is not everywhere and everything that is popping out of the screen, but actually just a few things). 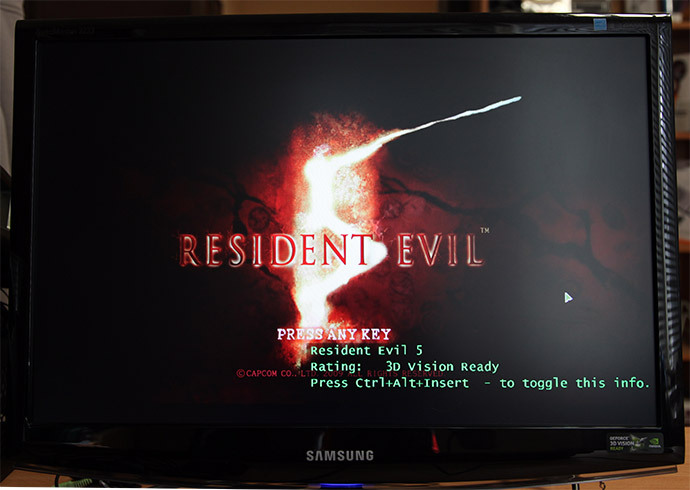 Resident Evil 5 is also the first game to support Stereoscopic 3D *EVERYTHING* – all levels, menus, and cut-scene movies (cinematics) can all be experienced in 3D using NVIDIA 3D Vision… even the start-screen and in-game item menus are in 3D. And here is what Nvidia recommends as best settings to really enjoy the games in Stereoscopic 3D mode with 3D Vision, just don’t forget that it is recommend to have at least Nvidia GeForce GTX260 for these settings to deliver comfortable gameplay. 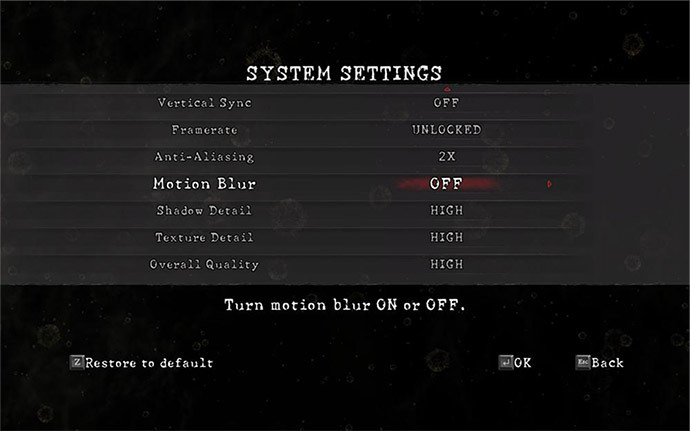 Set the Screen Resolution to 1680×1050 and Refresh Rate to 120Hz, and also optionally you can disable Motion Blur for better S3D effect in the game when using 3D Vision. And even if you still don’t have the GeForce 3D Vision shutter glasses and a compatible display you may still play the game in S3D mode with GeForce 3D Vision Discover or another plain paper anaglyph (red/cyan) glasses, but with not that good level of realism (don’t forget the disadvantages of the anaglyph technology).